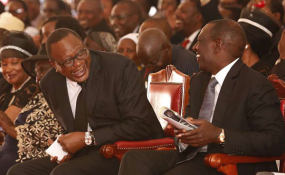 A section of Members of Parliament from the Jubilee Party, who identify themselves as #TeamKenya, are now calling for the ouster of Deputy President William Ruto. Speaking on Saturday at Kathiani Constituency, the legislators led by Ngunjiri Wambugu (Nyeri Town), Maina Kamanda (Nominated) and Robert Mbui (Kathiani) have threatened to invoke Article 150 of the Constitution on the 'removal of the Deputy President'. Under Article 150 of the Constitution of Kenya, the DP can be impeached (i) on the ground of a gross violation of a provision of this Constitution or any other law; (ii) where there are serious reasons to believe that the Deputy President has committed a crime under national or international law; or (iii) for gross misconduct. According to the MPs, the handshake between President Uhuru Kenyatta and ODM leader Raila Odinga has exposed the real theft of public funds. This development comes days after President Kenyatta publicly stated that not even his "closest political ally" would stand in his way in the fight against corruption. "If you are corrupt we will fight you. You can be my brother or my sister or my closest political ally. I won't be clouded by ethnicity or status in my quest to leave behind a united nation and I will continue championing for Kenya's unity," the president said.